BRUSSELS, Belgium -- The war had its roots in long-standing Russia instrumentalisation of the breakaway regions of South Ossetia and Abkhazia as a bargaining chip to influence Georgia's domestic policy. 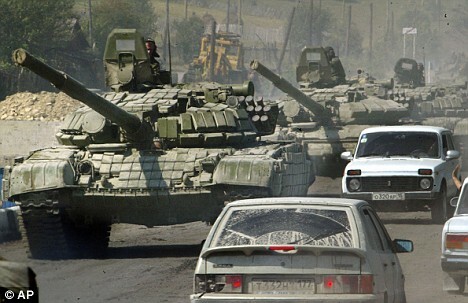 Russian tanks in South Ossetia. Above all, it was used as a tool to prevent Georgia from further strengthening ties with the West. Yet Russia could not offer the Georgians any viable path for social, political, and economic modernisation. Frustration mounted leading to the 2003 Rose Revolution and the ousting of the regime of Eduard Shevardnadze. Saakashvili, who rose to power after the revolution, tried to achieve two key objectives simultaneously, reunification of South Ossetia and Abkhzia, and the westernization of Georgia. Domestically, he tried to make the Georgian-controlled part of South Ossetia a showcase for economic and social modernisation (by entrusting Dimitri Sanakoev with the government of the region). He hoped that the successful Georgian modernisation process would lead for Ossetians in Tskhinvali to demand the same sooner or later, opening the path for re-unification. Internationally, he thought his reform course would enjoy Western support. He was wrong on both fronts. South Ossetia was and is firmly within the iron grasp of the Communist Party of Ossetia, totally dependent on Russian financial aid and Russian security services. Regardless of what the Ossetians might have wanted, South Ossetia was, de-facto, a Russian colony, unable to make its own decisions. Since 2006, Russia's defence establishment frequently aired the idea that a situation might occur in Georgia that would force Russia to intervene and so Russia was well prepared to intervene. After NATO rejected granting Georgia a military action plan in April 2008, Russian military preparations in Abkhazia and South Ossetia were ramped up: lines of communication were restored, military equipment was pre-positioned and Russian military presence was reinforced. From May of 2008, incidents and skirmishes increased. By mid-July 2008, the Russian 58th Army was conducting manoeuvres in the Northern Caucasus, manoeuvres that were officially supposed to end on 2nd August. But Russian troops remained in the area. On 7th August, Russian deployment to South Ossetia began. Fatefully, the Georgian leadership attempted to pre-empt further Russian aggression and advanced into Ossetian territory. In doing so, they allowed Russia to claim that Georgian aggression started the war. On the afternoon of the 8th, the Georgian advance came to a halt without advancing to the Roki Tunnel – the vital line of communication from Russia to South Ossetia. On 9th August the Russian Air Force started to strike deep into Georgian territory, while Russian paratroopers and mechanised forces started counterattacks on Georgian positions. On 10th August the Georgian positions were shattered and Georgian forces expelled from the hills around Tskhinvali. Five Russian motorised rifle regiments, two airborne regiments and units from four different reconnaissance and Special Forces brigades faced off against two Georgian brigades. From here the Russian military offence concentrated on Gori, in the Kura Valley. On the August 10th Western diplomatic efforts to achieve a ceasefire started, putting pressure on Russia. The same day Russian troops opened a second front in Abkhazia, making considerable progress due to the lack of Georgian preparations in the area. On the Ossetian front, Russian troops entered Gori on the 13th, one day after then French President Sarkozy secured both Russian and Georgian signatures on a ceasefire agreement. On August 14th, then US secretary of state Condoleeza Rice visited Georgia. At the time of the visit, Russian troops had advanced about 40km towards Tbilisi and raided the Black Sea port of Poti with light forces. Georgia had lost the war, but Russia was not able to exploit its military advantages in terms of numbers, geography, air-superiority and heavy equipment, hindered more by the disorganisation of the Russian troops than by Georgian resistance. If Russia had been as quick in 2008 as it was in Crimea in 2014, Tbilisi would have fallen before Western diplomacy could react. While Russia was not able to resolve the ‘Georgian issue’ in the course of just one weekend, it used the outcome to its own advantage. The territories under Russian control were enlarged. Perhaps most important of all, Russia was left in control of the last geographic obstacles between Tskinvali and the Kura valley, making effective Georgian defence against a renewed assault extremely difficult, if not impossible. After formally recognising the breakaway regions, Russia gradually increased its military presence in both regions, as well as in Armenia. This dire military situation looms large over Georgian politics and is increasingly narrowing the freedom of manoeuvre for Tblisi. By insisting on its own interpretation of the six-point agreement, Russia denies the EU monitoring mission any access to the breakaway regions. After expelling about 15,000 ethnic Georgians from South Ossetia, Russia controls the region more tightly than ever. Europe and the west drew very few lessons from the conflict. Saakashvili's mistake in participating in the Russian policy of escalation served as a major fig-leave for the west to restore “business as usual” policy with Russia. The very limited Russian information operation were effective in influencing Western (particularly German) public opinion, which soon tilted towards the Russian version of the events. Lines of Russian disinformation even penetrated the EU's own final report, which overplayed the significance of US support and military assistance to Georgia. Russia learned its lessons, however, its information operations were dramatically increased for the 2014 campaign in Ukraine, albeit with much less effectiveness than in 2008. In order not to repeat the Georgian experience Western governments advised Ukraine to not put up meaningful military resistance against Russian moves in Crimea (although at the time Ukraine the dire state of her armed forces gave her few options). But restraint in Crimea only meant that Russia started another war in the Donbas. As in Georgia, Russia used its own interpretation of the ceasefire agreement to create facts on the ground to its own advantage. In both conflicts, the West simply did not know how to equalise Russian escalation dominance. Ukraine is, compared to Georgia, much more capable militarily. Further Russian military advances would not remove Ukraine from the political map of Europe – at least not quickly. But that's not necessarily true for Georgia. With Russian troops having increased their capabilities and operational tempo significantly after 2008, a renewed Russian-Georgian war would probably be fatal for Georgia. In both countries, the West has no clear concept of how to deal with the respective, long-term EU and NATO membership aspirations of these countries. While after Georgia the West became cautious not to be caught up in regional military struggles, both conflicts show that refraining from meaningful support will be interpreted as an opportunity to escalate in Moscow. Short of formal EU membership, the association agreements provide some framework for developing closer relations between the EU, Georgia and Ukraine respectively. But in the dimension of hard security, European foreign policy has a void that Russia knows to exploit skillfully.